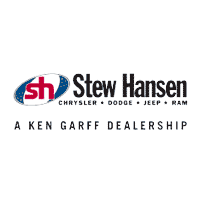 Here at Stew Hansen Chrysler Dodge Jeep Ram, we are eager to help you establish a financing program for your new or used vehicle that works with your current financial situation. We also provide valuable financial tools that can save you time and money like our online car loan calculator, which gives you an instant car loan rate estimate based on the information that you provide. From there you can proceed to our online finance application. We finance customers that come from a variety of financial situations. We will work with you whether you have good credit, bad credit or even no credit. Our strong vendor relationships and commitment to finding the perfect car loan vendor to suit your financing needs will put you in the driver’s seat faster and easier than you ever imagined. We also have low interest car loans for customers with existing loans. We can help you refinance your current car loan or adjust the term of the contract. You’re just one step away from driving off with your new car.